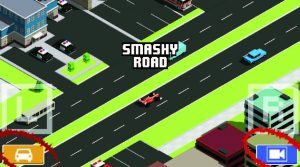 There is a bug in Smashy Road that lets you collect some easy money without being chased by cop cars. It can be abused and turned into a hack for collection even more money while you sleep. Yes you could just use our money generator but there is no guarantee that this will still work in future updates. It is always nice to have an alternative way to make easy cash. Plus this website is about EVERY hack, glitch, cheat, and bug under the sun–not just the easiest. When the pre-game starts you want to hold both buttons on the screen. This will back up your car like you would expect during game play. However because you are pressing the buttons you will not trigger the game to start–or cops to chase you. Using this you can back up onto the grass between the roads and then release. Your car will continue to move leisurely forward without the round starting up. Even though the game is not started real cash will still be found on the divider. Your car will collect it with no cops in sight– its easy money. The legendary moneyman, flipper, or “the beast” cars all have a X5 cash bonus. By using any of these 3 cars you can max out the usefulness of this bug and turn it into a hack. Don’t have one of these yet? Use the legendary cheat until you get one. You also want to have the widest vehicle possible so that you can pick up even if you are not 100% aligned onto the green midway. Ideally the flipper is best as it is one of the widest vehicles. By setting your phone to stay awake you can keep your car collecting money like this all night if you want. Depending on if you have an Android or Iphone just go to the settings and set it so your screen never gets darker. This is the one thing that can stop the auto-collection of money. If you do not align your car 100% parallel with the grass your car can drift out of range. You can avoid this with practice or if you are good at Smashy Road already. Having a wider vehicle will give you a larger margin of error to work with, so ideally you want to pick the flipper.